The Imperial Palace in Goslar is one of the biggest attractions of this historic German city. Goslar is located in the German state of Lower Saxony, whose natural resources are the main driving force for the prosperity of the settlement in the Middle Ages. Goslar is situated on the northwestern slopes of the Harz mountain. The incredibly beautiful and authentic old town of Goslar, Mines of Rammelsberg, and the majestic Imperial Palace Goslar have been listed as a UNESCO World Heritage Site since 1992. The Imperial Palace Goslar, known locally as the Kaiserpfalz palace is located slightly south of the old part of the town at the foot of Ramelsberg. The city and its intriguing, magnificent castle have been of strategic importance in German history since 1000 years ago. The palace was built by Emperor Heinrich II in the early 11th century. The foundations of the medieval castle were laid in 1040 and became a residence of the rulers when it was completed at the time of Henry III in 1050. 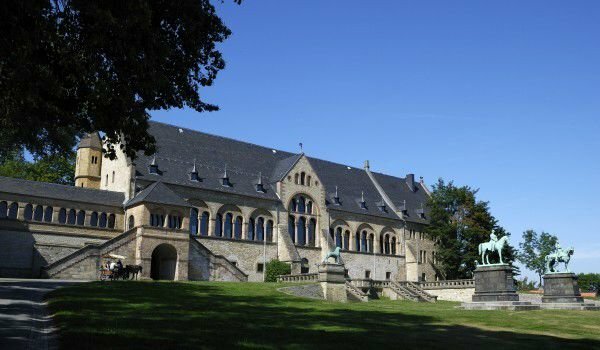 Over the next 2 centuries, the German history and largely the history of Europe have written about the Imperial Palace in Goslar. Today it is considered a unique monument of secular architecture. For many centuries the palace in Goslar remains a favorite seat of government in northern Germany. The palace complex is complemented by the unique St. Ulrich Chapel. To this day it is the sarcophagus of Emperor Henry III, who died in 1056. In the Middle Ages Goslar was both an imperial and religious center of the empire. The uniqueness of the town comes from over 47 churches and chapels with their numerous towers and bell towers, which won Goslar the nickname "Rome of the North ". In the 19th century the Imperial Palace Goslar and the medieval chapel underwent a complete restoration. In the upper hall of the castle you can see the incredible beautiful murals painted by the master H. Wislicenus. Today the castle is an obligatory stop for anyone who decides to visit the historic German city. There on the ground floor you can visit the interesting historical exposure. Within the gardens of the castle you can see the magnificent sculpture of Englishman Henry Moore, whom was the Goslar warrior.